Sedona is a well-known hub for people seeking the highest quality of life. Visitors and local residents alike, find solace, healing and spiritual enlightenment within the natural beauty and mystery of Sedona's famous red rock formations and vortices. ‘Unusual’ (esp. UFO) sky activity has been the norm in Sedona for many years... until now. Today, there appears to be an increase in the number of unexplained illnesses in our community, including: a plethora of severe allergies, breathing disorders, cancers, gastrointestinal disorders and memory loss. This statement is based upon the talk of the community, not formal health statistics. About two years ago, a few prudent members of the community approached the Sedona City Council with regard to increasing levels of, “jet aircraft emissions that persist for a long time and eventually form into man-made clouds,” (hereafter referred to as “man-made clouds” and/or “geo-engineering.”) The sky and ground in proximity to the "emissions," were found to contain unusual fallout that took the form of spiderweb-like and/or other odd materials. The "then city council members" were uninterested in the topic. They responded: That until such time community members could produce credible, scientific evidence, they would not address assertions of toxic fall-out or disquiet over man-made clouds. In light of an apparent increase in these unusual man-made clouds above Sedona, the state, the country, and major parts of the world, aware citizens have continued to pursue the matter. More and more credible information is pouring forth through contemporary sources such as the Internet and major global awareness campaigns. Films like Foster Gamble’s “Thrive” and Michael Murphy’s “What in the World are they Spraying,” are powerful examples. As a result of continued health and wellness problems, a peaceful, but very determined body of people from Sedona and the surrounding area have formed a group known as Sedona Skywatch. 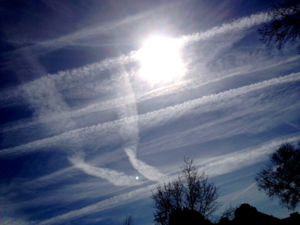 There has been a severe lack of public acknowledgement and absence of information regarding man-made clouds by parties responsible for these activities. The people have yet to receive official announcement of their purpose. In fact, (based upon Internet reports and books written on the subject) satisfactory answers to inquiries have actually been denied. This breeds distrust and suspicion. Our once beautiful blue skies are now hazy and gray. Our once bright, yellow sun is now a dull shade of silver. Sedona Skywatch has been proactively organizing since March 2012 and gathering in public community spaces for the sole intention of educating ourselves and the community. It is our goal to understand the ”man-made cloud phenomenon," its purpose, risks, and possible ties to community illnesses. We are examining positive and proactive ways to approach the subject at the community-level. Sedona Skywatch is currently organizing and networking with other like-minded communities across the country, and the globe. Seeking the truth, and determining if this persistent man-made cloud activity has any implications to health and wellness, is our primary focus. Our networking activities are designed to share in the dissemination of any and all credible information related to the topic. Sedona Skywatch is being structured to collect, assess, and disseminate facts, and to inform the public on the matter of man-made clouds. Sedona Skywatch’s future course of action will depend upon the outcome of facts that result from our educational and networking activities. Once again, we emphasize that we are a nonviolent group of conscious and committed citizens. We are seeking answers to questions that are being ignored and/or intentionally swept under the rug. This instills doubt and skepticism towards the powers that claim to be working on our behalf. 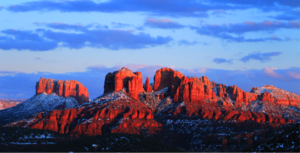 Sedona Skywatch stands for the good of the people. Sedona Skywatch is currently looking for new members and volunteers. Please send us an email with your contact info and we will get back with you as soon as time allows: Info@SedonaSkyWatch.com.